In 2009 Hope Rivenburg, the young widow of murdered trucker Jason Rivenburg, vowed to change the perils of the truck parking shortage by standing up and fighting for legislation, allowing more safe truck parking. People everywhere, including trucking, said the possibility for a bill to pass creating funding for more parking could not be accomplished. Her relentless struggle has proved them wrong. There were many obstacles along the way, as are so many worth while causes, and she could have easily given up, but she didn’t. She not only didn’t give up, but Hope was able to rally the trucking community around her to ensure the goal of federal funding for more safe truck parking. The murder of Hope’s trucker husband, Jason Rivenburg, was vowed not to be in vain. 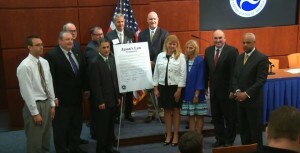 Friday August 21, 2015, an exciting, satisfying, and emotional day for Hope Rivenburg, who was the focal point of the truck parking survey announcement and signing a pledge of commitment and support in Washington DC. The newly created National Coalition on Truck Parking and DOT reps, had their official briefing and truck parking commitment to support the need for more truck parking. Hope Rivenburg, DOT reps and stakeholder groups all openly signed the pledge, forming the newly created National Coalition on Truck Parking. Participating in the announcement were federal Department of Transportation representatives: Deputy Secretary Victor Mendez, Federal Highway Safety Administrator Gregory Nadeau and Federal Motor Carrier Safety Acting Administrator Scott Darling, all agreeing that if it wasn’t for Hope Rivenburg none of this would have ever happened. The official signing represented the pledge and commitment to resolve and address the safety of our highways, especially our nations truck drivers. The announcement and outward display supported the results of the national truck-parking survey authorized by the MAP-21 highway bill. Stakeholders expected to be very active in the newly formed coalition include FHWA, FMCSA the American Association of State Highway and Transportation Officials, the American Trucking Associations, the Owner Operator Independent Drivers Association, the National Association of Truck Stop Operators and the Commercial Vehicle Safety Alliance. 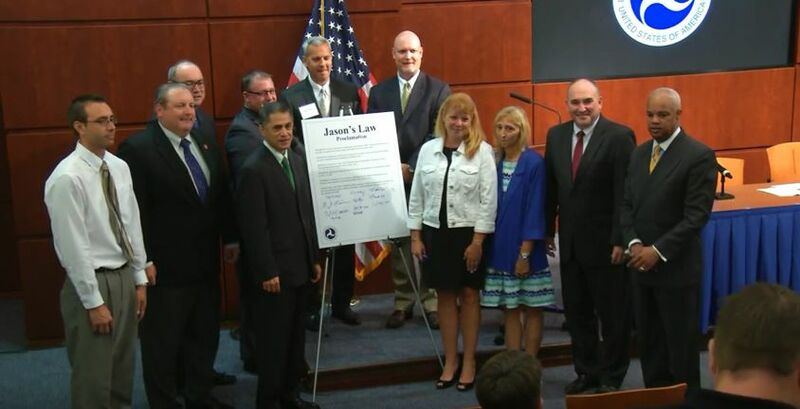 There have been many supporters of Jason’s Law, including Congressman Paul Tonko (D-NY) who first introduced the bill Jason Law to the house on April 28th 2009. The movement for more safe truck parking spread throughout the trucking community, leading up to a series of National Call in Days to Washington Senators and Congressman. So without deep pockets, but instead a burning desire and memory of her murdered husband and the 3 children (all under 3) that were left behind, Hope Rivenburg did her own lobbying, and on her dime, knocking on doors in Washington explaining Jason’s Law, her story, and the vision to save trucker lives by allowing them a safe haven to rest. 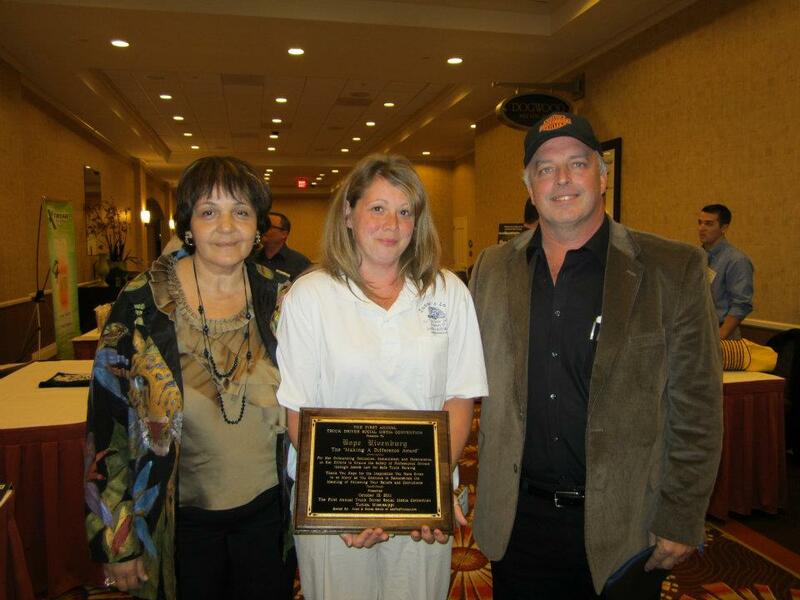 By now, Hope Rivenburg had the support of thousands, and in 2011 she was awarded the “Making a Difference Award” at the First Truck Driver Social Media Convention. . Although momentum continued to grow, there were still many who said that getting Jason’s Law passed would be an impossible goal, however in 2012 Jason’s Law and the need for more safe truck parking was included as part of MAP 21, Section 1401 of the Transportation Bill. It was labeled a priority. It was a victory. Hope Rivenburg however, did not want to wait for the authorized Map 21 Federal Parking Study to be conducted, so she gathered a group of passionate and knowledgeable people shortly after the authorized DOT study was included in the Transportation bill. They aided her in conducting her OWN truck parking the survey. Special thanks to Desiree Wood who dedicated hundreds of hours aiding in the design, gathering of data, results and conclusions. Then, On June 26th 2014, 30 year old OTR trucker Michael Boeglin of Ferdinand, Ind. was shot and killed in his truck as he parked at an abandoned building waiting to pick up a load from the nearby ThyssenKrupp steel plant. A radio show on AskTheTrucker ‘Live, “Truck Parking Shortage- Drivers at Risk,” soon followed the death of Michael Boeglin. Hope Rivenburg, Desiree Wood, widow Ashley Boeglin, and David Clark discussed Michael and Jasons murders and the need for more safe truck parking. Hope Rivenburg is a single mom of three and has paid her own expenses. She has made multiple trips a year to DC and continues to speak with numerous agencies and trucking advocacy organizations. Your generous support is appreciated. Send your contribution to Jason’s Law, PO Box 121, Fultonham, NY 12017. The Truth About Trucking network, including AskTheTrucker.com and AskTheTrucker ‘Live’ on Blog Talk Radio, have been supporting and reporting Jason’s Law since 2009. There are numerous articles on this website which follow the timeline of events, including the struggles which Hope Rivenburg endured in order to ensure that the Truck Parking Shortage would make national awareness and eventually be resolved. It has. Thank you Hope Rivenburg, an inspiration to so many. © 2015 – 2016, Allen Smith. All rights reserved.